Bjerringbro-Silkeborg’s tallest player Nikolaj Markussen will not be playing this Saturday against Orlen Wisla Plock in Poland. Even if the Danish team advances from the two playoff matches against the polish team he wont be playing any more matches in this season of VELUX EHF Champions League due to an injury in his little toe. The injury occurred when he played against Hungary with the national handball team of Denmark in the beginning of January. He went on playing during the entire World Championship, which Denmark hosted and won. Back in Bjerringbro-Silkeborg they decided to examn Markussen’s injury further, and they found that the injury was more severe, than the Danish national team thought, and surgery was necessary. “If they had examined the injury further immediately, maybe we could have avoided surgery,” says Jesper Schou, CEO in Bjerringbro-Silkeborg. 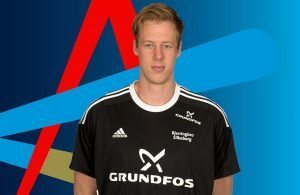 But because of the surgery, Nikolaj Markussen will not be able to play for the rest of the tournament in the Danish league (Herre Håndbold Ligaen), in Champions League or in the Final4 in Denmark in one month. Bjerringbro-Silkeborg will therefore be playing against Orlen Wisla Plock without Nikolaj Markussen this Saturday the 23rd of February at 6.00 pm. Photo credits: Ole Mørk, Midtjysk-Photo.